One of our most requested pieces to date, “Year of the Dragon” serves as stunning wall decor or window art. 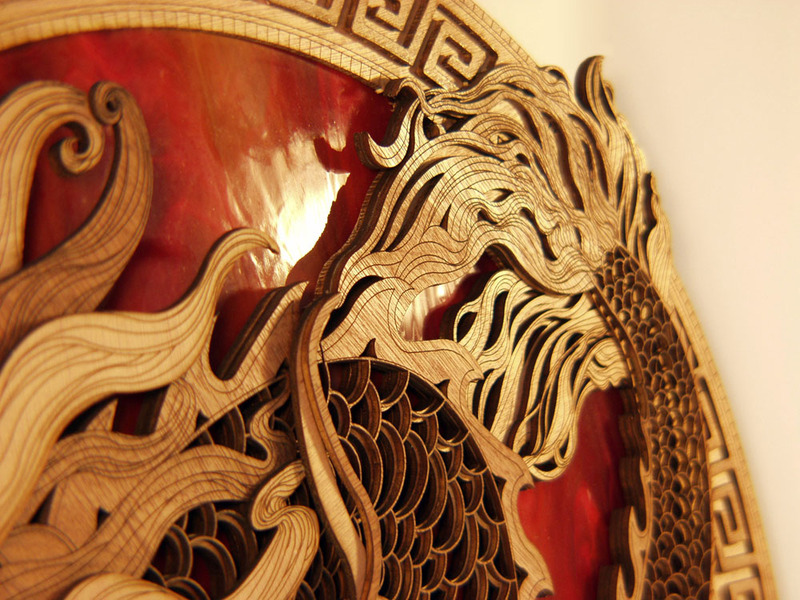 “Year of the Dragon” is crafted from 12 sheets of wood laser cut into 23 separate pieces that carefully enfold a circular sheet of stained glass. The finished piece has a diameter of more than two feet. Both the wood stain and glass selections can be customized, allowing “Year of the Dragon” to complement the color palette of your room. 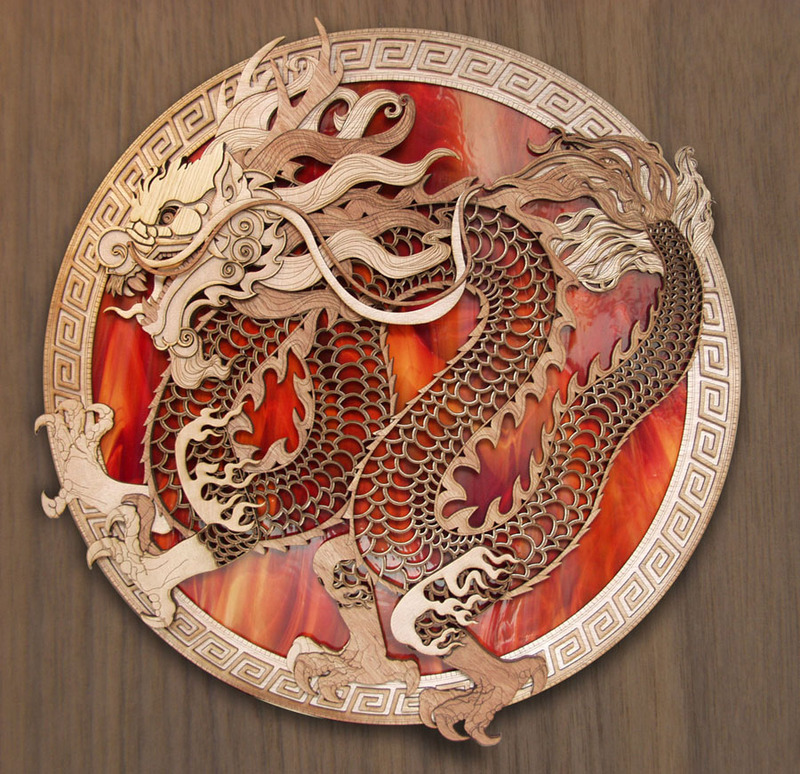 Wall-mounted pieces can be fitted with LED rim lights, giving “Year of the Dragon” a radiant glow from within. Whether hung above a mantelpiece or displayed in a window and shining with captured midday light, this piece will transform any room. 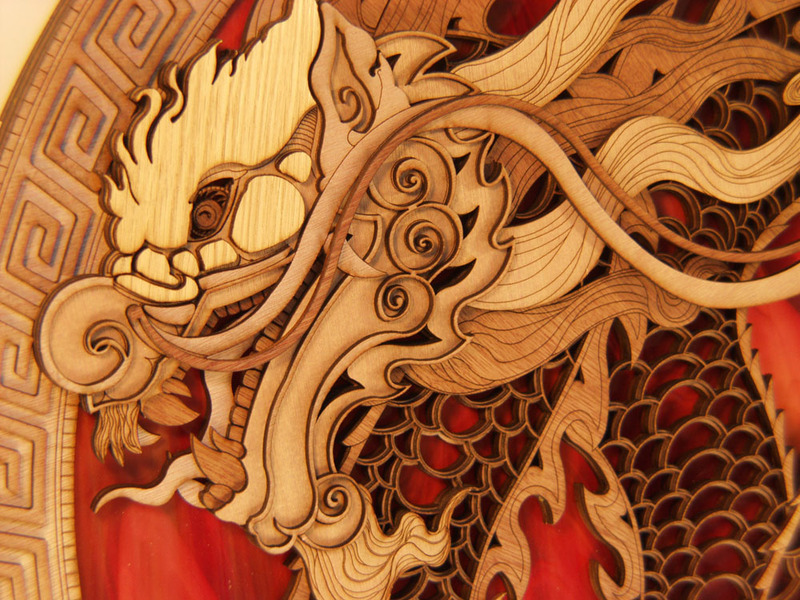 An original design inspired by motifs from China’s Han and Qing Dynasties, “Year of the Dragon” is a hand-finished, intricately detailed, layered piece of wall/window art. That intricacy is demonstrated in the dragon's head, which includes fierce eyes, whip-like whiskers, overlapping rows of fangs, and a curling mane. 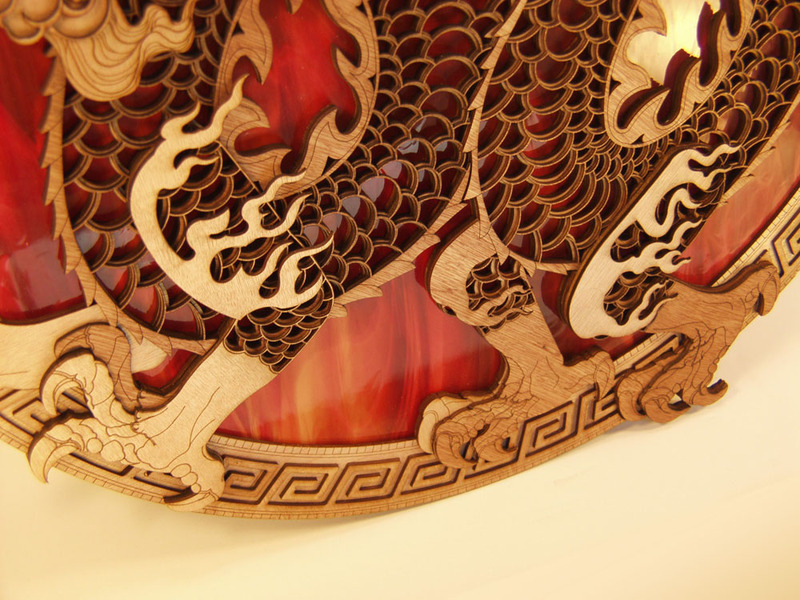 The overall design for “Year of the Dragon” mirrors the duality of its component materials—laser-cut wood and traditional stained glass—by balancing complexity with unity, energy with elegance. The elaborate details in this unique wall art begin with the dragon’s head, continue through the curves of every scale, and extend to the very tip of the dragon’s tail. With a breadth of more than two feet and intricate layers waiting to be explored, “Year of the Dragon” is a visual feast when viewed from across a room and up close. The creation of “Year of the Dragon” involved months of researching representations of dragons from across Chinese history and hand-sketching original designs. The sketches were then digitally refined to find the proper balance for each element of the design while meeting the structural needs for a large piece of wall and window art.